My research is mostly concerned with digital-UI-interaction-data design, data visualization aesthetics and creative informatics. My work spans the whole spectrum, from theory to implementation techniques and applications. Please note that the definitive versions of these papers are the published versions. The PostScript versions are sometimes provided here as a courtesy, and, in some cases, there may be differences between the PostScript provided here and the published version. I believe that all of the differences are either formatting differences or copy-editing changes. If you cite these papers, please cite the published version rather than giving a URL. David Bihanic (sous la dir.) (2019) Design en regards. Art Book Magazine (ABM)—EnsAD—La Cité du design, Paris/Saint-Étienne, 497 pages. Broché. plusieurs acteurs francophones de l’enseignement du design ici réunis partagent leurs regards, leurs convictions et réflexions, tentant ainsi d’y apporter certains éléments de réponse. To what may the difference in how Design is taught be attributed today? The fundamentals of its teachings are in a state of relative upheaval, and the trend seems to be moving gradually away from an approach rooted in the one-way transmission of its history, culture and theory, and more closely towards one rooted in mutual learning and practice. Johannes Itten and Walter Gropius firmly believed that Design Education was closely tied to the evolution of the inner being and the accomplishments related thereto, and was, in no way, to be a hindrance to the creative process or potential. For others, though, the field is the sole means to knowledge acquisition through the pooling of both think-how and design-how, enabling greater subjectivity and fostering an enlightened and free conscientiousness. The texts gathered in this volume attest to the diversity of myriad players in the French-speaking community of Design Teaching, and attempt to shed light on a question that is not only complex, but also crucial. To find out more, visit the book page on lespressesdureel.com. • Frédéric Valentin, Télécom ParisTech, Paris, France. David Bihanic (2018) Data Design. Les données comme materiau de création. Gallimard, coll. Alternatives, Paris, 76 pages. Relié integra. Book Cover: ©Jan Willem Tulp, Trillions of Trees. Par certains aspects (pratiques, techniques principalement), la profusion actuelle de données est un problème dont la résolution, manifestement complexe, appelle une contribution et un effort soutenus d’experts de nombreuses sections disciplinaires. Par d’autres côtés et points de vue, ces monceaux de données s’élevant chaque jour un peu plus constituent une véritable fortune dont plusieurs s’accordent à dire qu’elle composera bientôt le ‘lit’, le terreau ou substrat d’une appréhension et compréhension renouvelées du monde contemporain et de ses affairements. Non loin des scientifiques, des ingénieurs notamment, les designers de données (‘data designers’) entendent prendre leur part du travail. Moins directement préoccupés ou plutôt empêchés par les obstacles techniques, ils se proposent d’avancer en éclaireurs, en explorateurs de ce nouveau monde. Retirant de leurs aventures créatives autant en discernement qu’en acuité sur la valeur qu’il convient d’attacher aux données, ces designers réussissent dès lors à prouver qu’il y a plus souvent lieu de se réjouir de leur foisonnement que de regretter les désagréments et méfaits qu’il nous en coûte. 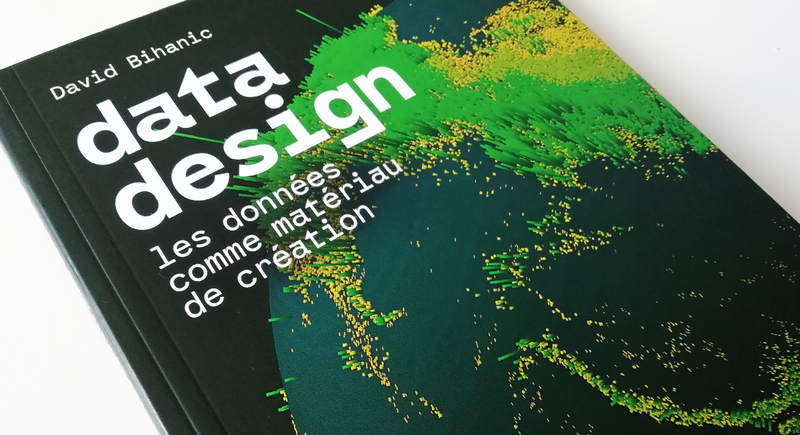 Ce livre, dont la forme à multiples dépliants encourage la surprise et la déambulation, présente l’extraordinaire diversité des médiums et des pratiques de data design : objets, sculptures, installations, infographies, visualisations interactives, etc. L’ensemble des productions ici rassemblées met en lumière le caractère immatériel des données et leur immanente présence. To find out more, visit the book page on gallimard.fr. Head of Visualization engineering at Uber. Entrepreneuriat and Digital Champion (European Commission). Designer and CEO of NoDesign studio. 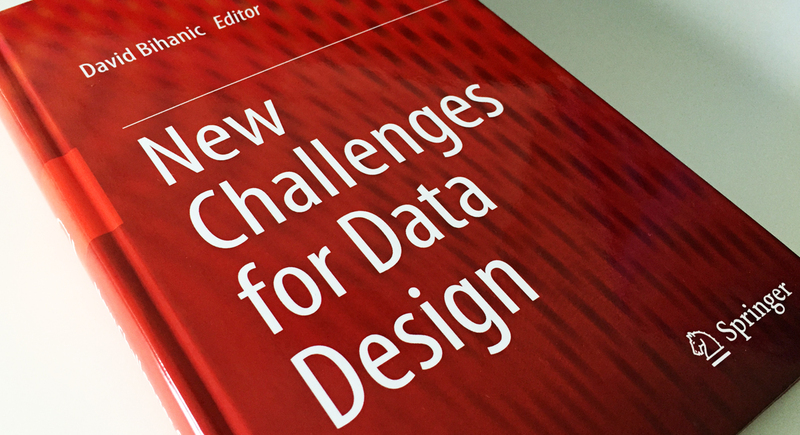 David Bihanic ed (2015) New Challenges for Data Design. Springer, London, 447 pages. Hardcover. This book provides a platform for leading Data designers whose vision and creativity help us to anticipate major changes occurring in the Data Design field, and pre-empt the future. Each of them strives to provide new answers to the question, “What challenges await Data Design?” To avoid falling into too narrow a mind-set, each works hard to elucidate the breadth of Data Design today and to demonstrate its widespread application across a variety of business sectors. With end users in mind, designer-contributors bring to light the myriad of purposes for which the field was originally intended, forging the bond even further between Data Design and the aims and intentions of those who contribute to it. The first seven parts of the book outline the scope of Data Design, and presents a line-up of “viewpoints” that highlight this discipline’s main topics, and offers an in-depth look into practices boasting both foresight and imagination. The eighth and final part features a series of interviews with Data designers and artists whose methods embody originality and marked singularity. As a result, a number of enlightening concepts and bright ideas unfold within the confines of this book to help dispel the thick fog around this new and still relatively unknown discipline. A plethora of equally eye-opening and edifying new terms, words, and key expressions also unfurl. Informing, influencing, and inspiring are just a few of the buzz words belonging to an initiative that is, first and foremost, a creative one, not to mention the possibility to discern the ever-changing and naturally complex nature of today’s datasphere. Providing an invaluable and cutting-edge resource for design researchers, this work is also intended for students, professionals and practitioners involved in Data Design, Interaction Design, Digital & Media Design, Data & Information Visualization, Computer Science and Engineering. To find out more, visit the book page on springer.com. Click here to consult the table of contents. Click here to read the preface. 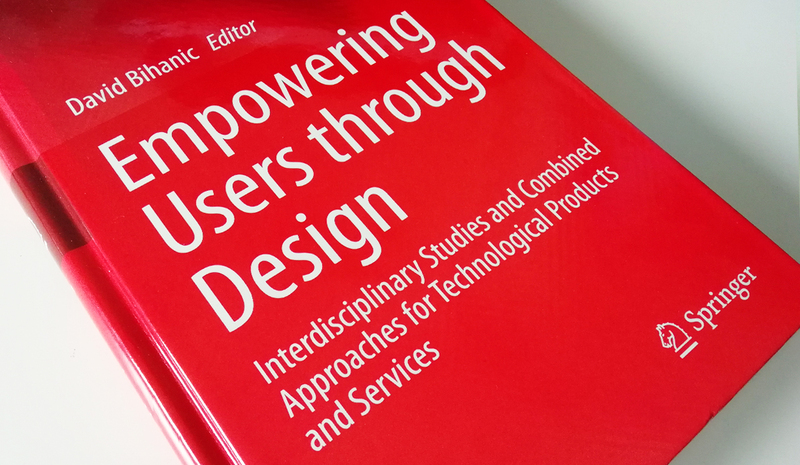 David Bihanic ed (2015) Empowering Users through Design. Interdisciplinary Studies and Combined Approaches for Technological Products and Services. Springer, Cham (Switzerland), 284 pages. Hardcover. At the crossroads of various disciplines, this collective work examines the possibility of a new end-user “engagement” in ongoing digital/technological products and services development. It provides an overview of recent research specifically focused on the user’s democratic participation and empowerment. It also enables readers to better identify the main opportunities of participatory design, a concept which encourages the blurring of the role between user and designer. This allows people to escape their status as “end-user” and to elevate themselves to the level of creator. This book explores new avenues for rethinking the processes and practices of corporate innovation in order to cope with current socio-economic and technological changes. In so doing, it aims to help companies renew industrial models that allow them to design and produce new ranges of technological products and services by giving the user an active role in the development process, far beyond the basic role of consumer. Intended for designers, design researchers and scientists interested in innovation and technology management, this book also provides a valuable resource for professionals involved in technology-based innovation processes. December 2015: Co-editor (with Philippe Gauthier from the University of Montreal) of the second issue of the scientific journal “Sciences du Design” published by PUF (“Presses Universitaires de France”) entitled: “Practices and discourses” (thematic focus).
. 6 exhibitions, and public demonstrations/presentations. To be published in August 2018: David Bihanic, Of the research pratice, “De la pratique en recherche”, Chapter in the collective book entitled “De l’atelier au labo”/”From the studio to the lab”. Hermann Editions, Paris. David Bihanic, The scientific statement format in art and design, Lecture at the two-day conference entitled “Nous ne sommes pas le nombre que nous croyons être”/“We are not the number we believe to be” round-table dedicated to Art and Design research publications with the participation of the following other lecturers: Lucile Haute, Julie Blanc, Anthony Masure, Robin de Mourat, Vincent Piccolo, Annick Rivoire and Nolwenn Tréhondart) organised by the Daniel & Nina Carasso Foundation in partnership with the “École Polytechnique”, the “École Nationale Supérieure des Arts Décoratifs”, and the “Cité internationale des Arts”, February 2-3, 2018, “Cité internationale des Arts”, Paris. Oussama Mubarak, Pierre Cubaud, David Bihanic, Samuel Bianchini, Designing Collaborative Co-Located Interaction for an Artistic Installation. In proceedings of the 16th IFIP TC 13 International Conference (INTERACT 2017, Human-Computer Interaction), September 25–29, 2017, Mumbai, India. Oussama Mubarak, David Bihanic, Pierre Cubaud, Samuel Bianchini, Art installations: a study of the topology of collective co-located interactions. In proceedings of the 8th International Conference on Digital Arts (ARTECH 2017), September 6-8, 2017 Macau, China. David Bihanic, Discrepancies in Work Time (The major OECD countries), “Durée du temps de travail dans les principaux pays de l’OCDE”, “Sciences du Design” 1/2017 (n° 5), PUF, Paris, pp. 22-27. URL : <https://www.cairn.info/revue-sciences-du-design-2017-1-page-22.htm> (published online January, 2017). Aurélie Daanen, David Bihanic, Geneviève Filipi, François Palaci, Gilles Rourgon, Pascal Salembier, Ergonomics and Design: cross scientific expertise on the characterization of information production and sharing experience in complex industrial environments, “Design & Ergonomie: du partage d’expertise pour une caractérisation de l’expérience de production et d’échange de l’information en environnement complexe”, Lecture at the World Design Summit (WDS), October 16-25 2017, Montreal Montreal, Quebec/Canada. David Bihanic, Deadly crossings to Europe, Conference “Where to find refuge today?”, 25-year Symposium of the NGO SIF (an international Non Governmental solidarity Organization acting in the fields of humanitarian and development aid, in France and worldwide), Musée des confluences, May 17, 2017, Lyon. David Bihanic, Memories of Deportations, “Mémoires des déportations”, Testimonies of deportees — Nazi concentration camps and killing centers of European Jewry, produced and directed by “l’Union des Déportés d’Auschwitz ” (UDA) with the support of “la Fondation pour la Mémoire de la Shoah”, “l’Institut National de l’Audiovisuel” (INA), “la Mairie de Paris” (The City Hall of Paris) and “la Direction de la Mémoire, du Patrimoine et des Archives” (DMPA) of the department of National Defence. David Bihanic, Deadly crossings to Europe, Conference “Data Publics: Investigating the formation and representation of crowds, groups and clusters in digital economies” at Lancaster University, 31st March-2nd April, 2017 organized by Clara Crivellaro (Newcastle University), Joe Deville (Lancaster University), Daniel Richards (Lancaster University), Sebastian Weise (Newcastle University), and Louise Mullagh (Lancaster University / conference coordination and exhibition curation). David Bihanic, Research practice, practice-based research, “Pratique de la recherche, recherche par la pratique”, Lecture at the Cité du Design (auditorium) during the 2017 International Design Biennial, Saint-Etienne (France), “Journée de présentation de la rénovation de la filière Design & Métiers d’art”, March 29 mars 2017. David BIHANIC, Flashback on a data visualization project: Deadly crossings to Europe, Meetings AFK #9, Le Tank (co-working space supported by the region Islands France), March 22, 2017, Paris. Aurélie Daanen, David Bihanic, Geneviève Filipi, Gilles Rougon, Pascal Salembier, Ergonomics and Design: cross scientific expertise, “Ergonomie et design : partage d’expertise de la conception”, Conference “La conception d’un artefact: approches ergonomiques et didactiques”, October 6-7 2016, Haute Ecole Pédagogique in the Canton of Vaud, Lausanne, Switzerland. Proceedings published as a book by the UTBM academic press (University of Technology of Belfort-Montbéliard — Northeastern France) and Alphil Editions. Oussama Mubarak, David Bihanic, Samuel Bianchini, Artistic devices and installations: a study of the topology of collective co-located interactions, “Dispositifs & installations artistiques : étude de la topologie des interactions collectives co-localisées”, IHM Conference (IHM’16) (28th edition) — Francophone Conference on HCI, October 25-28, 2016, Fribourg, Switzerland. David Bihanic, Deadly crossings to Europe: Refugees crossing Mediterranean (2000-2016). This webmap project obtained the recommendation of the International Organization for Migration (IOM), 2016. David Bihanic, Flood vs Drought. Infographics, 2016. David Bihanic, Migrant remittances from France. Infographics, 2016. David Bihanic, The series lies within in objects (keynote), “La série est dans l’objet”, 6th International Forum of Design as a Process — Systems and Design, June 22-24 2016, Universitat Politècnica de València, Spain. In partnership with Latin Network for the development of Design Processes. David Bihanic, The digital pollution, “La pollution numérique”, “Sciences du Design” 1/2016 (n° 3), PUF, Paris, pp. 22-25. URL: <https://www.cairn.info/revue-sciences-du-design-2016-1-page-22.htm> (published online June, 2016). David Bihanic, Numbers in colors: the use of color in Data Design, “Données en couleurs: de l’emploi de l’attribut couleur en data design”, Study day entitled “About Color — objectivity”, organized by the “Haute École des Arts du Rhin” (HEAR), MESHS et iCAVS — Interdisciplinary Cluster for the Advancement of Visual Studies. Affiliated research laboratories: CEAC (EA 3587), GERIICO (EA 4073), IRHIS (UMR 8529), Painlevé laboratory (UMR 8524), LIFL (EA 4491), LISIC (EA 4491), STL (UMR 8163), URECA (EA 1059), MESHS (USR 3185) — Proceedings published as a book by –zeug editions and the “Haute École des Arts du Rhin” (HEAR), June 2016. David Bihanic, The role of Practice in Research, “De la pratique en recherche”, Study day entitled “Research and Creation”, University of Valenciennes and Hainaut-Cambresis/CALHISTE Laboratory (EA 4343), Valenciennes, April 2-3 2015. Proceedings published as a book by Hermann editions (book editor: Catherine Chomarat-Ruiz), 2016. David Bihanic, Thomas Polacsek, StrataVis: a new model-oriented visualization technique, “StrataVis : une technique de visualisation graphique orientée modèle”, Computer Sciences and Techniques (“Techniques et Sciences Informatiques” — TSI), Special Issue “Visualization and manipulation of complex models” (edited by David Bihanic, Sophie Dupuy-Chessa, Xavier Le Pallec, and Thomas Polacsek), Hermes-Lavoisier edition press, Paris, May 2016. David Bihanic, The global innovation race, “La course à l’innovation”, “Sciences du Design” 2/2015 (n° 2), PUF, Paris, p. 11-14. URL: <http://www.cairn.info/revue-sciences-du-design-2015-2-page-11.htm> (published online December, 2015). David Bihanic, When sounds become forms, “Quand les sons deviennent formes”, Étape (international design magazine), N°226 (july-august 2015), Pyramid Edition, Paris, pp. 106-108. David Bihanic, Interview with Ben Willers for infogr8 (based in London ). Trend Report Spring 2015 — Data Led Content. URL: <http://infogr8.com/blog-graphic-design/trend-report-2015/> (published online March 26, 2015). David Bihanic, Corinne Beck, CALHISTE Laboratory: an institutional research model promoting interdisciplinarity, “CALHISTE: modèle de la transversalité pour une recherche en Arts/Lettres et SHS”, “Matinée des chercheurs 2015” (MdC’2015), University of Mons (Belgium), Polytechnic Faculty in Mons, March 10 2015. David Bihanic, Giving Shape to Data, in New Challenges for Data Design, Springer, London, Chapter 2, pp. 23-53. David Bihanic, Pierre-Damien Huyghe, Form Follows Practice, in Empowering Users through Design. Interdisciplinary Studies and Combined Approaches for Technological Products and Services, Springer, Cham, Chapiter 1, pp. 1-13. David BIHANIC, Introduction to RES conference (research in data visualization), Opening day of MESHS research program “Work and Creation”, November 6 2014, Lille. David Bihanic, Data Design, “Du design de données (data design)”, IHM Conference (IHM’14) (26th edition) — Francophone Conference on HCI, October 28-31 2014, Lille. David Bihanic, Applied Research in Design, “De la recherche en projets”, Theme days entitled “Design Research, a challenge for the new University of Paris-Saclay” organized by Claire Brunet, the “École Normale Superieure Cachan”, October 15-16 2014, Cachan. David Bihanic, Designing data flow: a conceptual framework for the analysis of new data flow visualization models, “Design de grands flux de données. Cadre conceptuel d’analyse esthétique cognitive des modèles ‘non-conventionnels’ de représentation-visualisation de données”, Computer Sciences and Techniques (“Techniques et Sciences Informatiques” — TSI), Special Issue “Visualizing Massive Data” (edited by Jean Daniel Fekete and Pierre Dragicevic), Hermes-Lavoisier edition press, Paris, September 2014, pp. 499-539. David Bihanic, Sophie Dupuy-Chessa, Xavier Le Pallec, Thierry Morineau, Thomas Polacsek, Visualization and manipulation of complex models, “Manipulation et visualisation de modèles complexes”, National days of the GdR GPL research group (6th edition), Session “Challenges in Software Engineering for 2025”, June 11-13 2014, CNAM, pp. 183-187. David Bihanic, Research in Data Design, Research cycle called “Petits déjeuners valorisation” organized by MESHS — conference session entitled “Copyright Matters in Research” (“Le droit d’auteur au service de la recherche”) directed by Anne-Laure Stérin, December 19 2014, MESHS, Lille. David Bihanic, A l’avant-garde! Graphic Design in the digital era, “À l’avant-garde ! Du Design graphique à l’heure du numérique”, Étapes (international design magazine), N°215 (july-august 2013), Pyramid Edition, Paris, pp. 100-103. David Bihanic, Schizoid Architecture: interview with François Roche, L’ARCA International (international magazine devoted to Architecture, design and visual communication — published in three languages: French/Italian/English), N°113 (july-august 2013), M.D.O. Editions, Monaco, pp. 66-75. 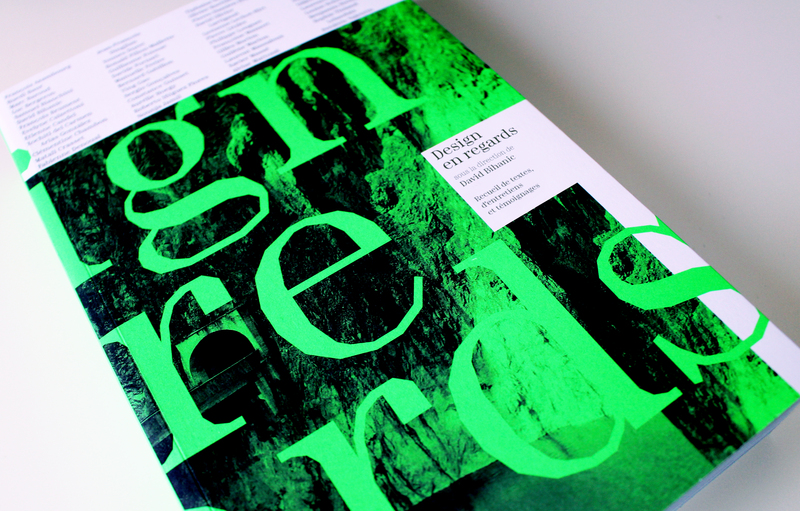 David Bihanic, Crossover design: the cross-cutting approach to creation, “Crossover design. Transversalité et quête du style”, Étapes (international design magazine), N°212 (march-april 2013), Pyramid Edition, Paris, pp. 211-215. David Bihanic, Max Chevalier, Sophie Dupuy-Chessa, Xavier Le Pallec, Thierry Morineau, Thomas Polacsek. Graphical modeling of information systems: visual processing of complex models, “Modélisation graphique des SI : Du traitement visuel de modèles complexes”, May 29-31 2013, INFORSID’2013 (31th Congress), University of Paris I Pantheon-Sorbonne. David Bihanic, Shape It Yourself! the promise of creative emancipation, “Shape It Yourself! La promesse d’une émancipation créative”, Étapes (international design magazine), N°201 (november-december 2012), Pyramid Edition, Paris. David Bihanic, Thomas Polacsek, Models for visualisation of Complex Information Systems. In Proceedings of the IEEE Symposium on Information Visualisation 2012 (16th International symposium), IEEE Computer Society, Montpellier, July 10-13, 2012. David Bihanic, Thomas Polacsek, Visualisation of Complex Information Systems, “Visualisation de Systèmes d’Informations Complexes”, Studia Informatica Universalis, Hermann editions, Paris, Vol. 10, Special issue: “Computer and Mathematical Modelling for Complex Systems: methodological advances”/“Modélisation informatique et mathématique des systèmes complexes : avancées méthodologiques”, June 2012 [29 pages]. David Bihanic, Interview n°085 in Étapes (international design magazine), N°200 — 200 interviews with experts in the field of design (january 2012), Pyramid Edition, Paris. David Bihanic, Mesh design, Invited Lecture at the research seminar: “Collective imaginaries, new technologies, and societies. Design and the quest for meaning”/“Imaginaires, technologies, société. Design et quête de sens”, co-organized by ESAD Reims (“École Supérieure d’Art et de Design”, School of Higher Education in Art and Design), The Research Group: “Ethics, Technology, Organizations, Society”/“Éthique, Technologies, Organisations, Société” (ETOS) of Telecom ParisTech (“Télécom École de Management”, a public business school) and SIANA association, January 13 2012, ESAD, Reims. David Bihanic, Urban design & informatics, Invited Lecture at the one-day conference: “Art in the city”/“L’Art dans la ville” (other lecturers: Dominique Jakob, Brendan MacFarlane, Pierre-Damien Huyghe, Éric Corn, and Aurélien Maillard — moderator: Pierre Doze), October 22 2011, IFM (“Institut Français de la Mode”, a french research centre and Observatory (also a postgraduate school) on Textile Fashion, Luxury and Design), Paris. David Bihanic, Thomas Polacsek, Visualisation of Information Systems: an extended viewpoint approach, “Visualisation des Systèmes d’Information : une approche par points de vue étendus”, May 24-26 2011, INFORSID’2011 (29th Congress), the “École Centrale de Lille”. Pierrick Thébault, David Bihanic, Henri Samier, Simon Richir, The bridge between physical and digital worlds: implication for the design of Internet-enabled products. In Proceedings of the Virtual Reality International Conference — VRIC (13th International symposium), Laval, April 6-8, 2011. Pierrick Thébault, Henri Samier, Simon Richir, David Bihanic, Designing for the Ubiquitous Computing era: towards the reinvention of everyday objects and the creation of new user experiences, International Journal of Design and Innovation Research (IJODIR), November 2011, Vol. 6, N°2 [25 pages]. David Bihanic, Design facing new complexity: challenges, issues and opportunities for design education, “Le design face à la complexité: défis, enjeux et perspectives pour l’enseignement du design”, Étapes (international design magazine), N°187 (december 2010), Pyramid Edition, Paris, pp. 65-67. David Bihanic, Thomas Polacsek, The contribution of datadesign research to complex system engineering, “Contribution du design à l’ingénierie des Systèmes Complexes”, October 11-13 2010, COMMISCO 2010: 1st Conference on Applied Mathematical Modelling and Computing for Complex Systems (“Modélisation Mathématique et Informatique des Systèmes Complexes”), IRD (“L’Institut de Recherche pour le Développement”, a French research organism, original and unique on the European development research scene), UMMISCO (“l’Unité de Modélisation Mathématique et Informatique des Systèmes Complexes”, Research Unit on Applied Mathematical Modelling and Computing for Complex Systems, The Pierre-and-Marie-Curie University, RNSC (“le Réseau National des Systèmes Complexes”, Complex Systems research network), IRD France-Nord center, Bondy. David Bihanic, Thomas Polacsek, Visualisation of Complex Information Systems: from viewpoints to models, “Visualisation des Systèmes d’Informations Complexes : des points de vue aux modèles”, May 25-28 2010, INFORSID ERTSI+PeCUSI’2010, Polytechnic School of Marseille (“Polytech’Marseille”). David Bihanic, Interaction Oriented Design, “Du Design Orienté Interaction (DOI)”, Invited lecture at the “PraTIC” one-day conference: “Digital Design: discourses and realities”/“Le design numérique : discours et réalités”, June 1st 2010, Workshop “Vidéomatique”, Paragraphe Laboratory, University of Paris 8 Vincennes Saint-Denis in partnership with Gobelins (a school of applied arts, print and digital media managed by the Chamber of Commerce of Paris), Paris. David Bihanic, Design and prospective research, Invited lecture at the conference: “New approaches to innovation”/“Nouvelles approches de l’Innovation” (small and medium businesses — SMB program/“programme ambition PME”), System@tic Paris-Region systems & ICT Cluster, March 18 2010, Paris. David Bihanic, Living tomorrow, “Habiter demain”, in “The virtual living of the physical body”/“De l’espace du corps en présence” (edited by Pascale Weber and Jean Delsaux), University Presses of Nancy, Coll. “Epistemology of the body” (directed by Bernard Andrieu), March 2010, pp. 155-171. David Bihanic, Pervasive computing and context of use, “Informatique pervasive et usages en contextes”, Research seminar “Transdiciplnarity and digital humanities”, January 15 2010, Paris, School for Advanced Studies in the Social Sciences (“École des Hautes Etudes en Sciences Sociales — EHESS”), Edgar-Morin Center. David Bihanic, Object to be completed, “Making innovation”/“Produire de l’invention”, a workshop session focused on creative design approach to develop innovative product, Alcatel-Lucent — Bell labs (France), December 2 2009. David Bihanic, On technical/technological artifact-mediated communication, “De l’objet à la média(tisa)tion technique”, in “On the multimedia experience. Cultural issues in practice”/“De l’expérience multimédia. Usages et pratiques culturelles” (edited by Nicole Pignier), Hermes-Lavoisier edition press, Paris, July 2009, Chapter IV.9. David Bihanic, Digital home. Reflection about contemporary living spaces, “L’habitat numérique. Contribution au sens de l’habiter contemporain”, CAAD Futures 2009 conference, Research Group in Computer-Aided Design (“Groupe de Recherche en Conception Assistée par Ordinateur — GRCAO”) of the Unversity of Montreal, Design Research Canada (DRC), June 17-19 2009, Montreal, Quebec/Canada. David Bihanic, Livin’ bits: tangible, sensory interface concepts for communication, “De l’artificiel au vivant : les concepts d’interface tangible/sensorielle pour la communication”, Design and Emotion conference — Dare to desire, Hong Kong Polytechnic University — Design and Emotion society, October 6-9 2008, Hong Kong. David Bihanic, Hypermaps: the schemes of meaning, “Les hypercartes : des schèmes de signification”, in “Information and visualisation: issues, research and applications”/“Information and visualisation : enjeux, recherches et applications” (edited by Sophie Chauvin), Cepadues edition press, Toulouse (France), September 2008, Chapter 8. David Bihanic, Noody 1.0, A semantic search engine and RSS aggregator, 2007. David Bihanic, Space, Places and Hypermaps: study on network spatiality and information geography, “Espace, lieux et hypercartes. Étude sur la spatialité des réseaux et la géographie d’information”, PhD supervisor: Pierre-Damien Huyghe, University of Paris I Pantheon-Sorbonne (France), December 2007. David Bihanic, On reality of experience, Editorial coordinator of the first issue of a revue titled “Cadi” (“Cahier de recherche en design” — bilingual French/English) dedicated to experience design, School of Media and Design edition press (Nantes, France), November 2007, Interview with Régine Charvet-Pello (RCP design); Author of the article: “On reality of experience”/”De la réalité de l’expérience”, December 2007, pp. 4-7. David Bihanic, Noody: a R-C design project (Research and Creation), “Areas of conflu(x)ence: art, space and technology in the digital area”, October 4-6 2007, International conference, Sibiu (Roumania) — cultural European capital, 2580 association Cluj. David Bihanic, From territorial spaces/networks to data information modelisation/representation”, “De l’espace des réseaux au design d’information”, “Cross-cultural pratices on digital media: for new forms of social life”/“L’adaptation des pratiques culturelles sur support multimédia : vers de nouvelles formes de vie”, International academic conference organized by the Centre of Semiotics Research of the University of Limoges (France), October 13-14 2006. David Bihanic, Geocodes (software programs), “Géocodes (dispositifs informatiques)”, “Le temps des appareils” (dir. Pierre-Damien Huyghe — Universitu of Paris I Pantheon-Sorbonne), “Le Cube” Digital art gallery, February 2006, Paris. David Bihanic, Geocodes (software programs), “Géocodes (dispositifs informatiques)”, “Le temps des appareils” (dir. Pierre-Damien Huyghe — University of Paris I Pantheon-Sorbonne), “Faux Mouvement” Contemporary art gallery, May-June 2006, Metz (France). David Bihanic, Innovation by design, “Le design, un moteur d’innovation”, Webdesign International Festival (WIF) — International Webdesign University, February 2-4 2006, Ester Technopole in Limoges (France). David Bihanic, On the hypermodality of hypermedia systems, “H2PTM’05, create, play, share: networks experiences”/“H2PTM’05, créer, jouer, échanger : expériences de réseaux”, Hermes-Lavoisier edition press (conference proceedings), November 29-30/december 1st 2005, Paris (France), “Paragraphe” laboratory of The University of Paris 8 Vincennes Saint-Denis, pp. 145-153. David Bihanic, Device and method for extracting information from a database, and associated products, “Brevet international pour le compte de la société Thomson”, International patent for Thomson Licensing, Patent date: 16/06/2005; Patent number: WO/2005/055083; International patent application number: PCT/EP2004/053135. David Bihanic, Cartographic hypermdia systems (part 2), “Les hypermédia cartographiques (deuxième partie)”, Archée (a Quebec Online Magazine dedicated to digital media), December 2004, 5 pages. David Bihanic, Pervasive design: IFA 2005, “Le design pervasif : IFA 2005”, “In Media News” (an intranet journal of Thomson group), October 2004, 4 pages. David Bihanic, Conditions of a virtual locality, “Les conditions d’une localité du virtuel”, Plastik n°3 (a scientific revue of the University of Paris 1 Pantheon-Sorbonne), Scientific council of University of Paris I Pantheon-Sorbonne edition (France), Autumn 2003, pp. 83-87. David Bihanic, A complete system of tridimensional graphical representation of information: Crystal hy-map (short version), “Un système complet de représentation graphique tridimensionnelle de l’information : Crystal hy-map (version courte)”, Cosign’03, Computer Science department of the university of Teesside, September 9-12 2003, Middlesbrough. David Bihanic, Cartographic hypermedia systems (part 1), “Les hypermédia cartographiques (première partie)” (10 pages), “Journées Francophones de la Toile (JFT’2003)”, PolyTech’Tours, June 30/july 1-2 2003, Tours (France). David Bihanic, A complete system of tridimensional graphical representation of information: Crystal hy-map (long version), “Un système complet de représentation graphique tridimensionnelle de l’information : Crystal hy-map (version longue)”, “Cognition and Hypermedia tools”/“Compréhension et Hypermédia”, “Centre Universitaire Jean-François Champollion”, University of Toulouse-Le Mirail (LTC, LARA laboratories) — “IUFM Midi-Pyrénées” (CERFI, LAVEA laboratories), October 10-11 2002, Albi (France). David Bihanic, Crystal hy-map, European Summer University, Digital strategies of the living world/“Universités Européennes d’Eté, Stratégies Digitales du Vivant”, Faculty of Letters, Languages, Arts and Human Sciences of the Unviersity of La Rochelle/“Faculté des Lettres, Langues, Arts et Sciences Humaines de l’Université de La Rochelle”, September 7-13 2002, La Rochelle (France). David Bihanic (collab), GeoProcess, “Géo/Process”, Computer Art Exhibition (with the financial support of the French Ministry for Culture and Communications), 2001, Rennes (France). David Bihanic (collab), Mongrel (colour separation), Computer Art Exhibition in collaboration with Mongrel collective (directed by Graham Harwood et Matsuko Yokokoji — YoHa), Next Five Minutes Festival – N5M, March 12-14 1999, Amsterdam.